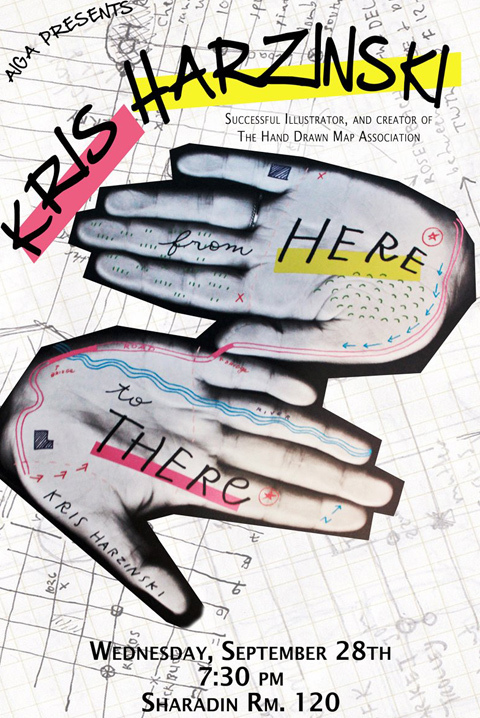 Kris Harzinski of the Hand Drawn Map Society will be coming to Kutztown University, Weds. Sept 28, Sharadin 120, 7:30 pm. Event is Free, open to the public & sponsored by our AIGA, American Institute of Graphic Arts chapter. Kris is a Philly-based designer and illustrator. In 2008 he founded the Hand Drawn Map Association, or HDMA. He collects maps that he finds, or that folk send to him and he wrote a book about these curious items for Princeton Architectural Press. I wrote about the HDMA and showed some of this quirky collection including a wild map of Pittsburgh in an earlier blog post, here. The Hand Drawn Map Association (HDMA) is an ongoing archive of user submitted maps and other interesting diagrams created by hand. Right now Kris is soliciting more maps and wants your mail. 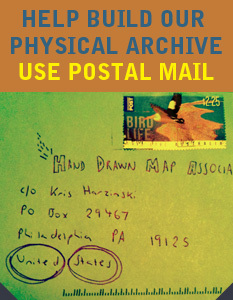 A notice on the website states, “In an effort to help increase the physical archive of the HDMA, all postal mail contributors will receive a free HDMA button as a thank-you.” Of course, If you come see him you can show him your map and save the postage.